What's the real value of future-proofing? While every man and his dog is throwing SATA 6Gbps interfaced SSDs at us as if there's no tomorrow, where does that leave everyone that is still packing SATA 3Gbps systems? Surely they deserve some modern SSD love too? 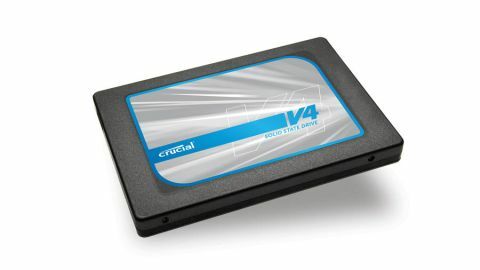 This is the premise behind Crucial's latest v4 family of drives: build a 3Gbps SSD at a good price so people with 3Gbps systems don't have to buy expensive 6Gbps models with features and performance they can't tap into. Seems vaguely sensible, right? While that would have been a sound idea when 6Gbps drives were relatively expensive, real life has dealt the Crucial v4 a kick where it hurts. The SSD market has become a little more cut throat sooner then most people expected and more than many ever thought possible. Right now you can buy SATA 6Gbps drives for almost the same price as the list price of the v4. Even Crucial has had to reduce the price of the 6Gbps m4 128GB to the point where it's only six quid more expensive than this drive. Go figure. Crucial quotes sequential read/write figures for the v4 at 230MB/s and 175MB/s respectively, which appears to be a bit on the conservative side as we managed to get 274MB/s reads and 233MB/s writes via the ATTO benchmark with our review drive. That's actually pretty decent performance for a mainstream 3Gbps SSD drive, so things looked relatively promising at first. Interestingly, the v4 contains something that's rare in these days of Marvell, Samsung and LSI SandForce controllers. It's actually built around a Phison PS3105-S5 chip. The controller uses custom Micron firmware (version S5FAMM22) and supports wear levelling, garbage collection and, importantly, TRIM. Unlike the LSI Sandforce controllers, the data isn't compressed. Instead a cache chip is used to buffer data, much the same way as the Marvell controller in the m4. This shows up in 4K AS SSD tests where the two Crucial SSDs are close in performance terms, unlike in the AS SSD sequential read performance, which shows the performance advantage of the 6Gbps interface rather well. Internally the drive is neatly laid out with one side of the PCB occupied by a Micron 166MHz DDR chip, which looks after the cache duties sitting alongside the Phison controller. These two are joined by four of the eight 16GB 25nm Micron MLC synchronous NAND chips that make up the storage capacity of the drive, with the remaining four NAND modules sitting on the other side of the board. While the prices for the faster 6Gbps drives were much more expensive than 3Gbps, Crucial's v4 would have made a lot of sense. Unfortunately the bear pit that is the SSD market at the moment has, in many cases, reduced that premium to almost nothing. It's pretty much a no-brainer then. Pay the extra and get a drive that's ready for you to upgrade, should you wish to at a point in the future.